Bethesda is one of the world’s biggest game developers, but this doesn’t mean that Bethesda will always deliver on its promises. Despite being the game developer who created amazing franchises such as The Elder Scrolls and Fallout, this past couple of months have not been that good for Bethesda. The company launched Fallout 76 which turned out to be a mess. Fallout 76 is buggy and it lacks many features that were promised to players. To make things even worse, Bethesda didn’t even give players who purchased the $200 edition of the game what they wanted. We think it’s safe to say that anyone who is a fan of the Fallout franchise knows just how much bad feedback Bethesda is getting for Fallout 76. This title showed that Bethesda is only looking to make money off the Fallout fan base and not to give them a game that they want. Nonetheless, the worst thing about this is that players who purchased the $200 version of the game didn’t receive what they were promised. Bethesda said that the $200 Ultimate Power Armor Edition of Fallout 76 will ship with lots of cool items such as a Fallout-themed canvas bag. Unfortunately, the bag was not made from canvas and it was made from cheap nylon material instead. Everyone who paid $200 for the Ultimate Power Edition of Fallout 76 got angry and revealed that Bethesda lied to them. 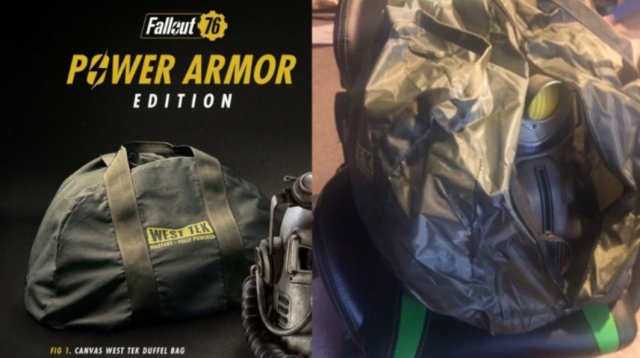 All players started criticizing Bethesda for fooling the fan base and the game developer felt forced to announce that it will make sure to send canvas bags to everyone who purchased the expensive version of $200. Even though Bethesda might be shipping canvas bags to players who paid $200 for Fallout 76, the only reason why the company is doing this is to avoid incoming lawsuits. In fact, a US law firm is actually gathering clients in hopes of starting a class-action lawsuit. Fallout 76 Map Leaks and It Looks Massive!